The spine represents the most common location for secondary tumours (Fehlings 2016). In the decision for surgical treatment, decompression of spinal structures and subsequent stabilisation of the spinal column with implants is essential. The removal of the tumour will be considered in parallel. 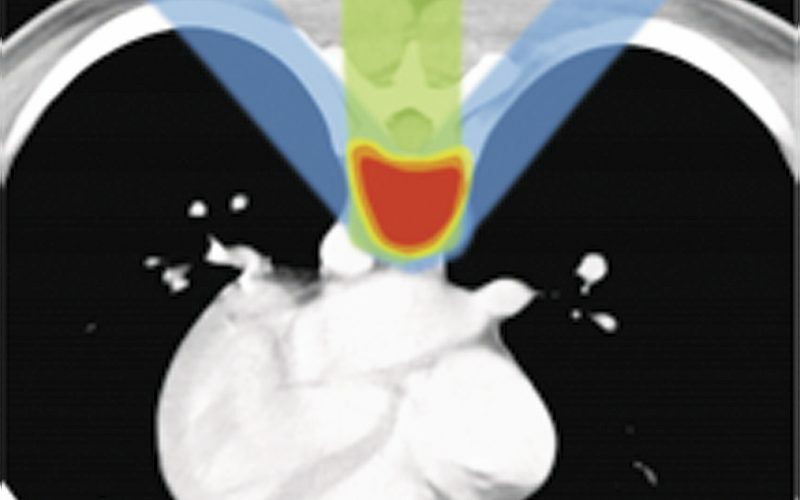 For pain control and local control of the tumour, supplemental radiation therapy utilising photons or protons is often applied postoperatively. Recent studies have shown the combination of surgical treatment combined with radiotherapy leads to better clinical outcomes than radiotherapy alone (Fehlings 2016). In radiation therapy, the presence of metal spinal implants will cause significant artifacts in the dose planning CT images. The artifacts make it much more difficult to delineate anatomic structures during dose planning and requires more time to correctly calculate the proper dose distributions. In contrast to metal implants, BlackArmor material is a nonmetallic, high-strength composite material, made of continuous carbon fibers and embedded in a PEEK-polymer matrix. 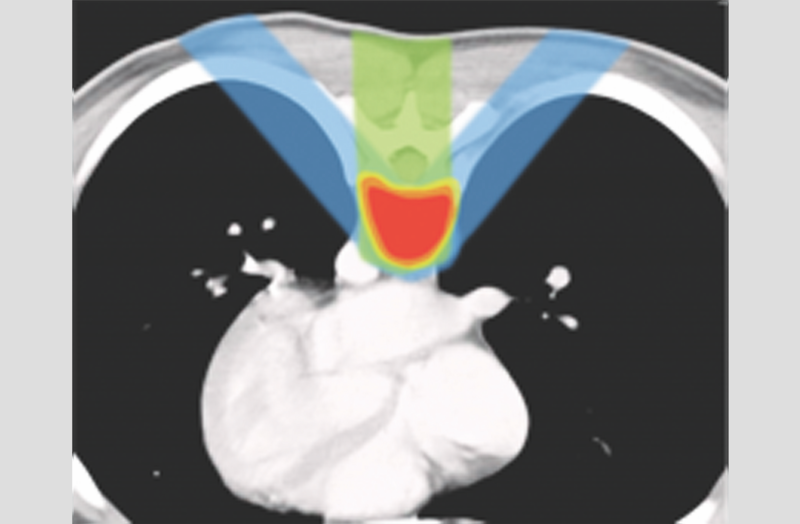 Due to its radiolucent nature, BlackArmor material causes only negligible imaging artifacts, thus enabling a precise demarcation of the tumour and planning of the doses in radiation therapy. The time-consuming manual corrections known from metallic implants are obsolete. Figure 1: Comparison of implant artifact in cadaveric model; left: significant artifacts caused by titanium pedicle screw; right: minimal artifacts with BlackArmor pedicle screw. During radiation therapy, metal implants will shield remaining tumour cells from the radiation and cause scattered radiation into the surrounding healthy tissue and organs. Therefore, in some cases, patients with metal implants must be excluded from curative proton therapy. In contrast, BlackArmor Carbon/PEEK implants allow the radiation beam to pass unimpeded through the material into the initially planned tumour tissue, without shielding or beam scattering. This minimises the risk of a radiation dose that is either too high or too low and thereby protects sensitive tissue. During follow-up control for recurrent disease in peri-implant tissues, which is usually difficult in areas adjacent to metal implants, the nonmetallic BlackArmor biomaterial also facilitates significantly better diagnostic images (CT and MRI). Figure 2: Dose planning for radiotherapy. New data (Schneider 2016) from the Center for Proton Therapy at Paul Scherrer Institute have shown for the first time that patients with metal implants who were treated with protons have a significantly (p < 0.05) lower overall survival rate (49 per cent) than those without any metal implant (66 per cent). It is currently unclear if this difference originates from metal implants compromising proton radiation or if the more aggressive disease is a cofactor. Radiation studies by Kashua (2016) and Gademann (2017) compared spinal constructs made of titanium versus those made of BlackArmor Carbon/PEEK material in a radiation-oncology setup. Both groups found significantly reduced artifacts for BlackArmor material, which resulted in a more accurate and homogenous dose planning and subsequent application of the dose with less beam scattering. 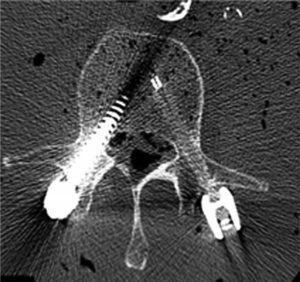 Recently published clinical results utilising BlackArmor Carbon/PEEK pedicle screws in spinal tumour surgery show comparable results to metal spinal hardware, but with significantly improved imaging characteristics and suitability for radiotherapy (Eicker 2017, Ringel 2017, Choi 2017 and Hartmann 2017). BlackArmor Carbon/PEEK material is utilised in CE-marked products since 2000 and obtained FDA clearance in 2005. The material is the result of a unique combination of continuous, high-strength carbon fibers and icotec’s Composite Flow Molding (CFM) process. As such, complex-shaped implants for load-bearing applications like pedicle screws or vertebral body replacements can be made from BlackArmor material.